What insurance agent in Knoxville is “bigger than life,” known just about anywhere he goes and is active in various causes in our area? The answer is Glenn Jacobs, owner of Jacobs Insurance Associates, LLC. 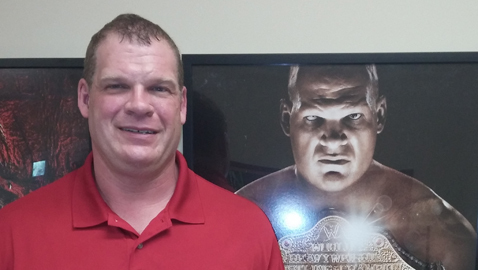 Jacobs might be better known as “Kane,” a WWE wrestling champion who is still active in that pursuit. Jacobs and his staff offer all types of insurance, from auto and boats to homeowners and business coverage. “We’re an independent agency and work with various companies to find the best coverage for applicants,” he said. The insurance agency, located on 6918 Neal Case Way in Halls, is proud of its “personal touch” with clients and sponsors a picnic for them each year and a Christmas Party. Being well-known isn’t always enough to maintain a business and Jacobs works hard to reach out to his customers with service and, in return, gets referrals. Jacobs and his wife, Crystal, are both insurance agents at different offices and both are involved in sponsoring and taking part in community promotions. They are helping sponsor the “Faith To End Hunger” program in Maynardville in conjunction with the Journey Church. The event will be held Friday, June 29 at Wilson Park from 5:00 – 8:00 p.m. The annual food drive is a family celebration with children’s games, a dunking booth and face painting. All proceeds go to the Union County Food Pantry. The couple also partner with Children’s Hospital to promote “One Unforgettable Night,” a dance for critically ill patients. They are also involved with “Kindness Revolution,” a nation-wide effort in schools and customer service organizations to promote acts of kindness and non-bullying. Jacobs was featured in “Dancing with the Knoxville Stars” benefit last year and placed second there in fundraising. Asked if he plans to retire from wrestling Jacobs said, “Maybe in a couple years.” He said he’s been lucky in the sport and only suffered a few injuries. Jacobs said there’s nothing like the feeling of impacting people’s lives in a positive way, whether it be from the wrestling ring or from one of his many community services. “It’s the coolest thing,” he said. The name “Kane” at first labeled Jacobs as a “villain” or anti-hero, but that has changed and he’s proud of his image and his insurance company. “Being able to help people” refers to Jacob’s life now, both in the community, the region, and in his business. You can contact Jacobs Insurance Associates at (865)622-4576. You can also email him at gjacobs@jacobsinsuranceassociates.com.